Everyday more and more people are questioning, seeking answers to our current economic, social and environmental problems. As we move past overshoot in the use of natural resources, humanity is faced with two questions? The first being, do we continue down the 'business as usual' road, or do we rethink our current paradigm and change our trajectory? One way will lead to certain collapse. The other will give us a better chance of mitigating catastrophic disruptions, lead us to greater connection and the ability to rebuild communities and ecosystems, and deliver real prosperity to all. "This a brilliant work of art, weaving for the reader the impact of our unsustainable energy choices to our unsustainable way of our day to day living, yet gives us trends, opportunities and solutions to make a correction on this track to self destruction..."
"Rethink...Your World, Your Future... explains why there is a disconnect between fact and reality. A must read for anyone wanting to understand the underlying trends influencing modern industrial world. Andrew offers hope and solutions for moving forward into the future." 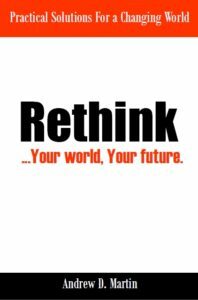 Rethink...Your world, Your Future... examines how our biased thought processes are holding us back from real progress. Rethink, explores the major challenges modern industrialised economies will face over coming years and the likely impacts this will have on society, economies and individuals. Rethink explores practical solutions which offer hope, guidance and a blueprint for moving forward. Only by rethinking and redesigning our lives, and place in the world, will humanity be able to move towards resiliency. Rethink offers practical solutions for a changing world. The big picture trends and shifts that will shape modern industrialised economies over the coming decades. How our biases and failures in cognitive thinking have been limiting humanity from true progress. What we must do to transition to a new prosperous more resilient world. How cheap energy has shaped modern civilisation and how the end of cheap energy is (and will continue to have) profound implications for modern society. Why new models of food production and distribution that help provide diversity, abundance and health benefits are needed.